Our objective: To enable near-zero CO2 emissions from power plants and carbon intensive industries. IC3 is demonstrating the impact of international collaboration with the allocation of $103 million in funding for carbon capture, from the European Commission, the U.S. Department of Energy, and the Accelerating Carbon Capture and Storage Technologies (ACT-CCS) consortium. A report on the Mission Innovation (MI) Carbon Capture, Utilisation, and Storage (CCUS) Experts’ Workshop held by IC3 in September 2017 in Houston, Texas was launched at the third Mission Innovation Ministerial in May 2018. Globally, power and industry account for about 50% of all greenhouse gas (GHG) emissions. Carbon Capture, Utilisation and Storage (CCUS) can achieve significant CO­2 reductions from power plants (fuelled by coal, natural gas, and biomass) and industrial applications (Figure 1). 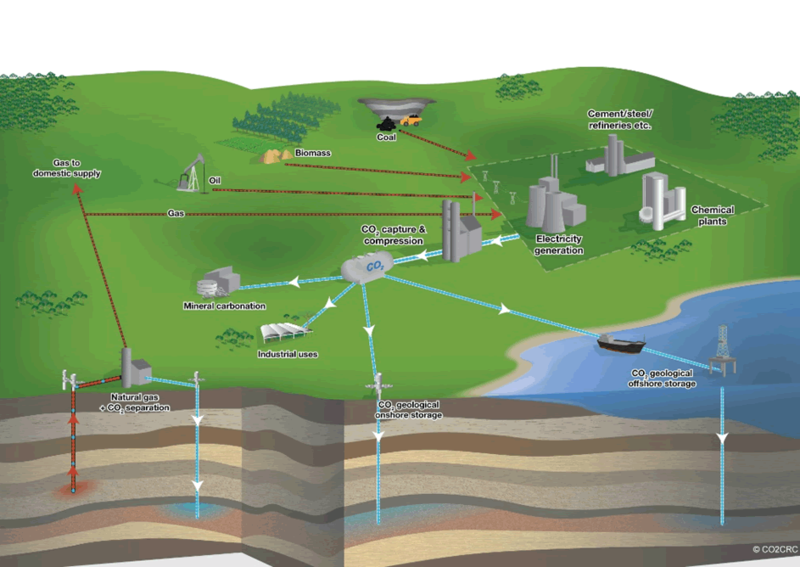 Industrial applications of CCUS include upstream oil and gas production, cement production, iron and steel production, and fertilizer manufacturing. These large (>100,000 t CO2/yr) point sources of CO2 emissions have few alternative options for significant reductions. Efforts to integrate bioenergy with CCUS also represent a pathway to negative emission technologies, which models suggest will become increasingly important in achieving deep decarbonisation. Technology could capture CO2 from, for example, the waste stream of bioenergy facilities for storage. Coordinated decarbonisation efforts must include the development of additional technologies that (1) prevent and curtail emissions of CO2, (2) result in carbon negative solutions, and (3) lead to safe and secure carbon storage. Achieving Paris Agreement targets will require a significant acceleration of the development and deployment of technologies that dramatically reduce the output of CO2. CCUS developments to date are noteworthy, but additional extensive and far-reaching efforts are required to combat climate change. Globally, the total CO2 capture capacity of the 22 current projects (in operation or construction) is about 40 million tonnes per annum. The IEA’s Energy Technology Perspectives report released in 2016 estimates that CCUS could provide 12% of the GHG emission reductions in the power sector needed to meet a 2°C scenario by 2050, or about 3.5 gigatonnes of abatement per year. In this scenario, 6.4 gigatonnes of CO2 are captured in 2050 in the power and industrial sectors combined. Projects in power and industrial sectors have continued to demonstrate the technical feasibility of CCUS. However, overall costs need to be reduced for the technology to be adopted at a sufficient scale to meet the challenges of climate change. The science and technologies supporting CCUS have experienced great advances over the last decade, yet opportunities remain for reducing costs, improving performance, creating better business and regulatory models, and discovering new uses for CO2. CCUS is one of the only technologies able to achieve significant decarbonisation of our fossil fuel based economies, particularly in carbon-intensive industries such as cement, iron and steel production. Operating CCUS projects offer important insight into the technical capabilities, policy and financing mechanisms, and permitting frameworks that could enable the successful deployment of CCUS. The goal of the Carbon Capture Innovation Challenge is twofold: first, to identify and prioritize breakthrough technologies; and second, to recommend research, development, and demonstration (RD&D) pathways and collaboration mechanisms. CCUS RD&D portfolios have grown, international collaboration has expanded, industrial CCUS projects continue to become operational, and the world’s first large-scale project in the power sector has commenced operation, with additional projects nearing completion. Further efforts must be focused on research and development to enable new and novel carbon capture technologies, aimed at driving down costs and facilitating broader deployment. Fundamental research should be directed in areas that could result in revolutionary, not just incremental, advances in gas separation and geologic storage of CO2. Parallel efforts to utilize CO2 must also be pursued, exploring the use of captured CO2 to create plastics or algal biofuels, carbonate materials, or other uses yet-to-be-discovered. These efforts must also be diverse, addressing CO2 emissions from all fuels, including coal, natural gas, and biofuels, and developing new technologies to enable CCUS integration with industrial processes. Initial efforts through Mission Innovation will need to identify what can be done differently to accelerate CCUS. Technologies will need to be developed, tested, and vetted in collaborative forums, building on past experiences and improving on current efforts to further reduce costs. New approaches to collaboration along the entire RD&D chain must also be envisioned to rapidly evaluate prototype technologies. In mid-2017, a technical Mission Innovation CCUS workshop will be hosted by the United States. The workshop will convene top experts to discuss breakthrough opportunities and find international RD&D synergies in carbon capture, geologic storage, and CO2 utilization.